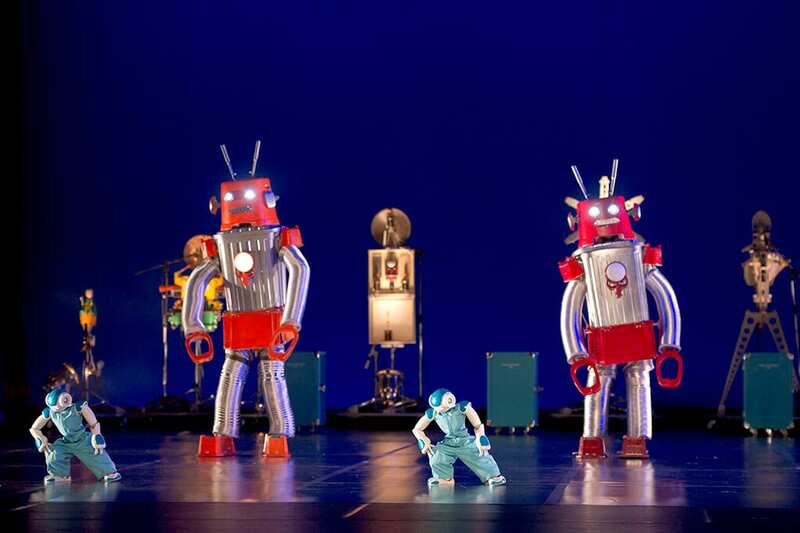 The production Robot by the Spanish choreographer Bianca Li and her dance company explores the theme of the relationship between men and machines in a light and very creative manner, as they mingle on stage in impressive dance movements. The performance starts with the powerful metaphor of human vulnerability and complexity, when images of internal body organs, as well as mechanisms such as clock parts, are projected onto the almost naked body of a dancer, so that the person is transformed into a kind of strange machine. This is followed by the energetic and very skillful dance routine of the whole ensemble of eight dancers in minimal clothing, namely flesh coloured underwear, so that we fully appreciate the abilities of their toned bodies. They stretch their arms and legs, creating different poses and trying on various roles, as if pushing the ability of human bodies to the limit and preparing to become anything at all but human. About half an hour later the fruits of their combined efforts are born: a robot the size of a toddler is brought out of a box and one of the dancers, Gaël Rougegrez, teaches it its first steps in a cute and entertaining routine – a reward for the many children in the audience, who were waiting long enough for the actual robots to appear. The tiny robot looks at his tutor just like a child, blinks and shyly tries to copy his steps, being an image of vulnerability. The robots in the production are not scary monsters as in “the rise of the machines”, but mainly very sweet and at times clumsy creatures, who tend to fall over. In terms of dance language, this can only mean that in the competition between humans and robots the humans are on the top, with their instinctive notion of balance, and they are in no danger from these colourful and generally adorable creatures. For the second part of the show the dancers are dressed in blue outfits reminding us of factory workers, but even then there is no real conflict between them and the robots that they are supposed to create and serve. At some point people and machines almost swap their roles, when the dancers come on stage dressed as old-fashioned robots and seem to be even clumsier and slower than the real ones. We see an almost robotic routine of people doing everyday chores, brushing their teeth and getting ready to go to work, performed by each dancer at high speed, as if reminding us of the increasingly fast tempo of modern life. 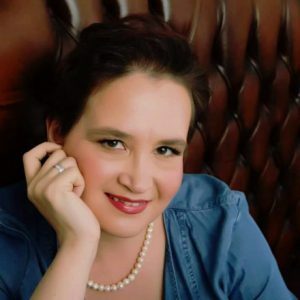 We see robots attempting to become humans, such as the one singing the famous song “Besame Mucho” or another one flirting with a female dancer and calling her “hot baby”. Although these scenes have the potential for creating dramatic tension, they remain disconnected. The music that accompanies the dancing is produced by self-playing robotic creatures, such as a drum with a funny face. They form a big part of the show, as they create all the sounds, attempting to simulate jazz-style music. However, they do not sound like proper musical instruments, and there is no alternative to the mechanical music in the production, so that the use of music does not add any dramatic effect to the show either. The main question for the creators of Robot is to whom have they addressed their performance and what message have they intended to convey, as this is not clear and the whole show is inconsistent. 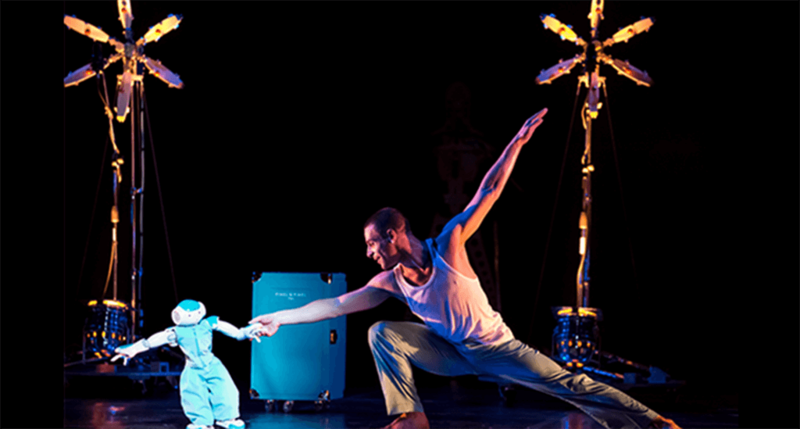 Children enjoy the part of the show when the robots are on stage and are bored when long dance routines take place. Adults are amused by the creativity of the whole team, but there is not enough food for thought, and the choreography does not develop throughout the show. We just see various sketches on the theme of men and machines. In fact, this theme is one of the most serious and almost tragic nowadays, when technology often replaces human communication. It is a shame that the show does not use the full potential of the subject that it chooses to talk about.